The unique double-sided construction and ripple effect of the kantha stitch hand embroidery is probably the most obvious sign you are looking at a kantha. However, you may or may not have noticed that some kanthas are very textured whereas others simply have the running stitch covering the whole surface of the quilt without much tactile quality. This comes down to how it has been made. Let’s start with the standard kantha technique of the running stitch which is entirely handcrafted. 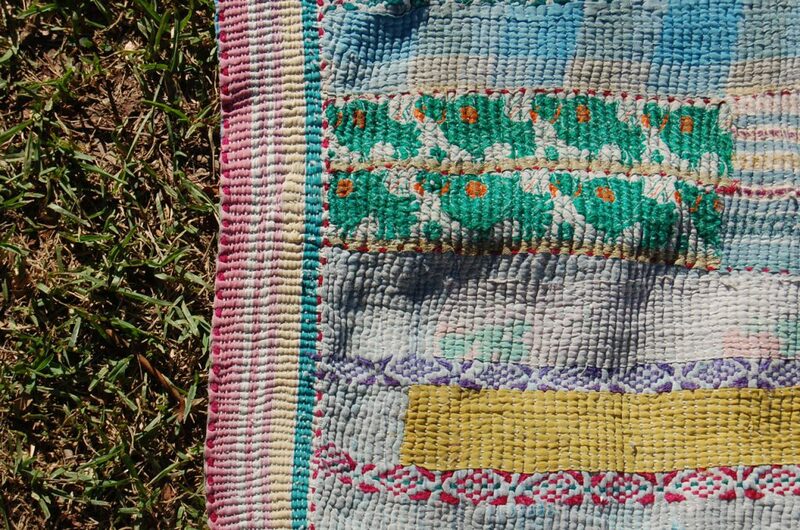 Every kantha is made up of this technique, the variations in this stitching however, can be quite diverse. 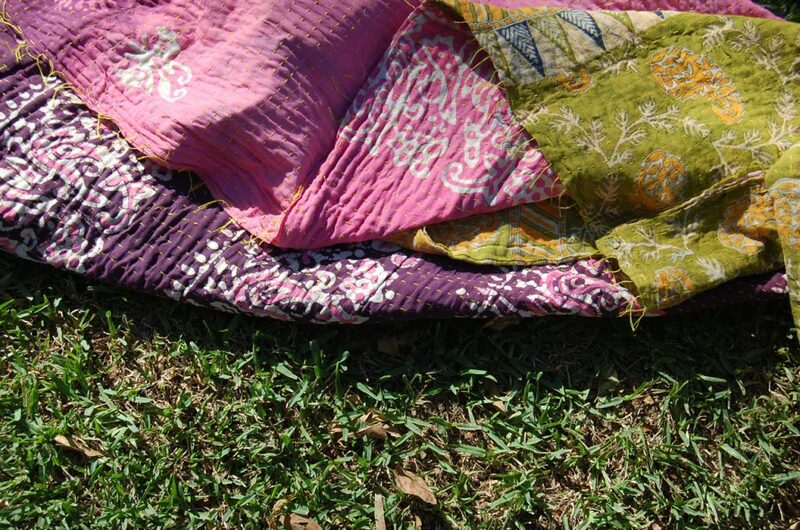 The raw kantha quilt’s stitching is usually fairly large and far-spaced, contributing to their looser construction. Usually the quilt will consist of between two to three layers, making it a softer, lighter blanket or throw. The raw finish of the edges may have unfinished lengths of threads, so if you prefer a neater finish, the light-weight kantha is your next best thing. If you’re new to kantha and would like a more affordable option, the wonderful array of colours and prints will have you fall in love instantly! AASHNI – a raw kantha – but don’t let the name fool you! 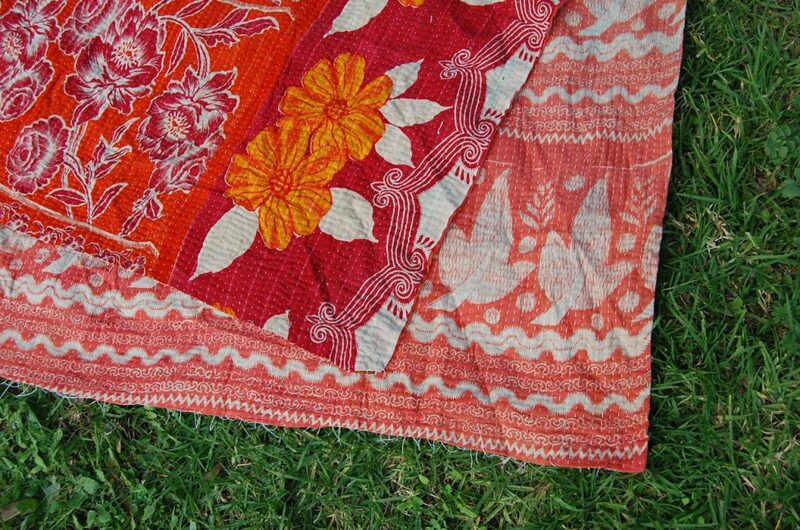 Next to raw, we have better quality kantha throws that have smaller stitching and a neater construction. These are still in the lighter range and can really be quite beautiful – they pack up quite small and can be taken on a picnic easily. This is where kantha really starts to shine! 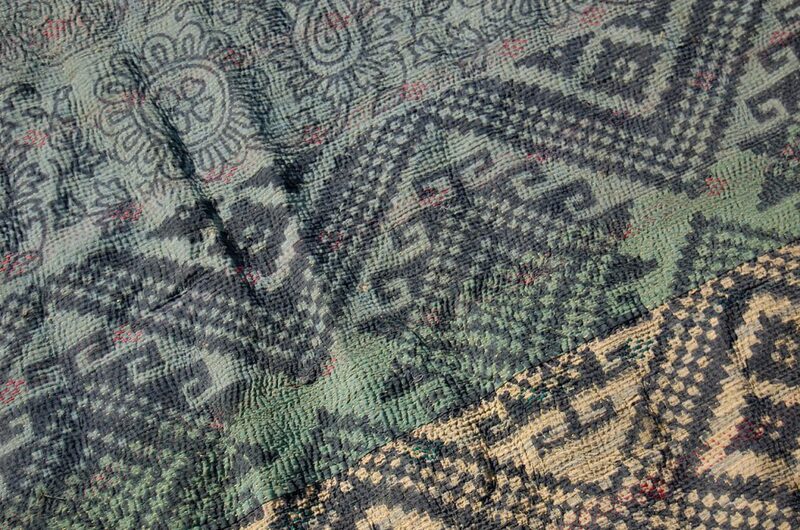 This is because the extra layers of cloth create a very tactile ripple effect unique to the kantha. The stitching is often tighter in the medium-weight quilts making them perfect as just that, quilts. Up to six or seven layers of saree cloth are used to create these wonderful texture-rich kantha quilts, giving them the strength and durability to last forever. The stitching is extra-tight – meaning the fabric is pulled (not flattened) when creating the tapestry. When you consider they are made 100% by hand, it’s hard not to appreciate this incredible craftsmanship – the perseverance, time and energy that goes into each stitch! With these you really get a quality quilt. Just look at the detail in the example below. It’s not just the extra weight and tight and close stitching that makes this category highly sought-after, they have extra detail and embellishment that truly makes them special. Often utilising special stitching techniques, a multitude of various coloured threads and if you’re lucky – some fabric disintegration which really has a wonderful effect on the surface showing through the inner layers! There is truly nothing else like it. See our MAHARAJA COLLECTION for some more like this. These kanthas are quite rare – having been refreshed with post-production printing or a dyeing process. Indigo Over-dye is one of the common colours used for over-dying of kantha throws. An indigo dye bath is made and the already finished throws are completed immersed in the dye. This results in an all-over blue quilt with the original colours and prints coming through. Other colours are also known to be used. Coming to store soon ~ is our very own Indigo Collection – six indigo over-dye kanthas, specially selected for our range! Tie-dye was an iconic feature of the 70s, but did you know you can also find kanthas that have been tie-dyed in a rainbow of colour? Whether they are genuine 70s relics or a more recent innovation to the kantha family – the process involves dyeing a completed kantha in a brighter array of colours using the tie-dye method. We are hoping to acquire some of these gems in our store – so keep your eyes peeled! 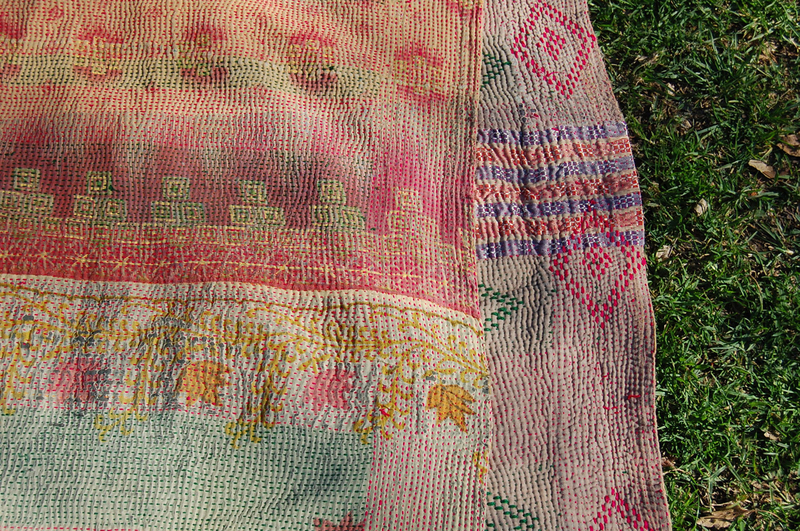 Post-printed using the block printing technique after the kantha has been stitched together is a rarity. These are often older kanthas also refreshed using an overlaid design coating any pre-existing patches and textile prints. 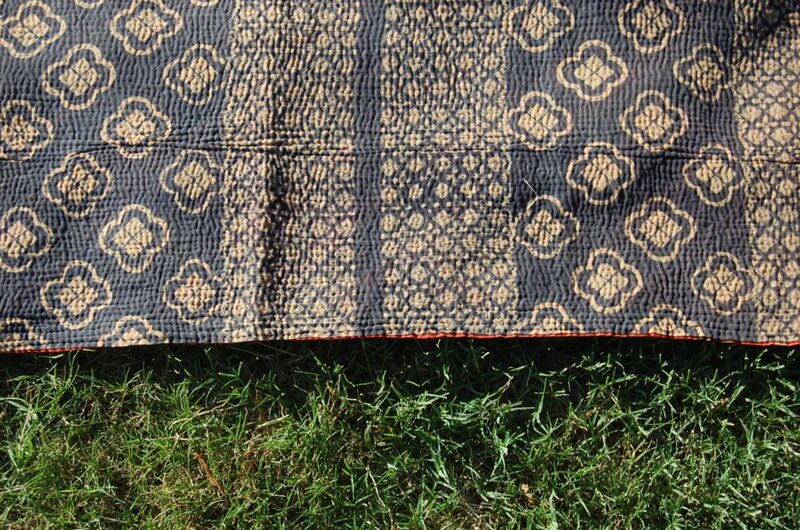 Check out this rare and unique kantha below – one of it’s kind in our store! Wow, what beautiful quilts. I didn’t know the word Kantha existed, although I have seen these sorts of covering before. They are pricey when looking at your shop, but the work that goes into making them explains the price, and that is still not enough for all the hours that go into making these. I currently do quilting, and I know how long it takes. It is a work of love. I was always fascinated by Indian fabrics – all the colors and textures! But I could never have thought that they have such unique differences in them. Great article, very detailed, it is so much easier now to look and see details in every kind of kantha. I know exactly what to look for when I go shopping!